Where Can I find Cheatgrass? Bromus tectorum, also known as Cheatgrass can be found in a multitude of locations, but is mostly located in arid or semi-arid regions (Speziale et al. 2013). Cheatgrass flourishes and grows well in almost any kind of soil, but for the most part the organism has been found to grow best in c oarse-textured soils. Because the grass grows so well in coarse-textured soils, it allows for the grass to overtake the natural habitat. The soil types that Bromus tectorum does not grow well in are heavy, dry, and saline soils. (CalIPC 2014) Even though Cheatgrass does not grow well in certain areas because of the soil, there are areas that do promote growth. These areas include pastures, vast fields, waste areas, areas where erosion is prominent, rangelands, roadsides, and open prairie lands. (USDA 2005) The grass is a winter annual so growth begins at a relatively low temperature range; the range begins around two degrees Celsius and ends around fifteen degrees Celsius (USDA 2005). The grass can survive through temperatures as low as negative thirty degrees Celsius because it acclimates to freezing temperatures rapidly (Bykova and Sage 2012). One of the main factors that unites environments populated by Bromus tectorum is the annual precipitation levels in those environments (Speziale et al. 2013, USDA 2005). An environment that receives six to twenty-seven inches of precipitation each year facilitates the growth of the grass because of the ample water supply (USDA 2005). These factors of temperature, soil, and precipitation of environments where Bromus tectorum thrives are reasons why the grass is such a successful invasive species. Cheatgrass is native to the Mediterranean Eurasian area (Speziale et al. 2013, Williams et al. 2011), which includes northern Europe, southwestern Asia, and the northern portion of Africa as well (Zouhar 2003). It is believe that grass was spread to different parts of the world through the initial migration of people. When people settled in different areas, they inadvertently brought Bromus tectorum seeds or plants through ship ballast, contaminated packaging, and tainted crop seeds (Zouhar 2003). This is believed to have happened during the 1800s. 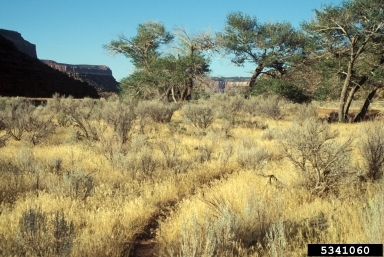 As soon as Cheatgrass was introduced to local environments, it adapted to the area’s conditions and began to spread into neighboring rangelands (Zouhar 2003). Bromus tectorum can now be found throughout Canada, northern Mexico and most of the United States in the western he misphere(Zouhar 2003 Goergen et al. 2011), and can also be spotted through most of Europe, western and central Asia, southern Russia, Japan, South Africa, Australia, New Zeeland, Iceland, and Greenland (“Global Invasive Species Database” 2005). There also are pockets of Cheatgrass that can be found in all of the provinces in Canada along with Alaska and Yukon Territory. In the United States, Bromus tectorum is a common invasive species in the Northern Great Plains, while in the east it is mostly considered a roadside weed. Even though Cheatgrass can be found throughout the United States, it is most noticeable and invasive in the Intermountain West. This is an area that extends west from the Rocky Mountains to the Cascade/Sierra Mountain range and north from the Northern California/Nevada area up into Canada (Zouhar 2003, Bykova and Sage 2012, and Rowe 2009). Recently, Cheatgrass has likewise been found invading the Patagonian region located in the southern portion of South America as well (Speziale et al. 2013). Cheatgrass is a highly successful invader. Cheatgrass significantly modifies the countless ecosystems it invades and because of this, the ecosystem no longer has the capacity to support the native vegetation. This allows Bromus tectorum to dominate areas under ideal conditions (Zouhar 2003).